The name Bhadrakali is combination of two words "Bha" and "Dra". Bha means 'delusion' or 'Maya' and Dra menas 'the most'. So the Bhadra means Maha Maya. In 625 A.D. the temple is build by King Pulakeshin II of Chalukya dynasty to commemorate his victory over Vengi region of Andhra Desham. Then temple is adopted by the Kakatiya Kings and considered Goddess Bhadrakali as their "Kula Devatha". The lake was built later by Ganapathi Deva. Due to the fall of Kakatiya Dynasty to the Muslim ruler of Delhi Ala-ud-din Khilji, his general Malik Kafur and later to Ghias-ud-Din Tughlak, and during the rule of Bahamani Sultans and Golkonda rulers, the temple lost its prominence over the period and the place has become dilapidated. 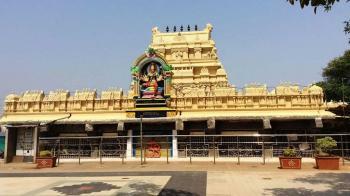 By Sri Ganapathi Sastri and Devi Upasaka the temple was renovated in the year of 1950. The timing of the temple is from 5:00 AM to 9:00 PM in all days of week. The best time to visit in the Temple is August and September. In Summer : The temperature in summer is 22 degree Celsius to 41 degree Celsius. In Winter : The temperature in winter is 15 degree Celsius to 30 degree Celsius. By Air : Hyderabad International Airport is the nearest airport from the temple. The distance of this airport is 176 km from temple. By Rail : Warangal Railway Station is the nearest railway station from the Temple. The distance of this railway station is 4.2 km from the temple. By Road : A number of RTC buses and private transport are available from Warangal. This place is well connected to all major cities.